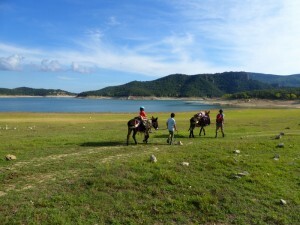 This donkey trail leads you in a big circle around the Pantano de Boadella, a crystal clear lake in between the hills and mountains of the Pre-Pyrenees. In this remote area of the Region of the Alt Emporà you will find a lot of cork oak forests, some nice middle-age villages and a beautiful mountainous landscape. The ways are easy and the days are not too long, so you can enjoy the nice places to take a swim in the rivers or the lake. 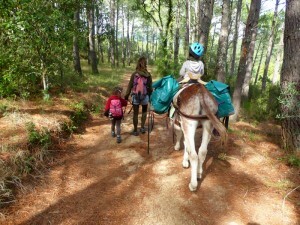 Also, this is a good option for trekking with kids, or for a first donkeytrekking and/or camping adventure. The trail starts and ends in Darnius. Darnius is a small charming village in between the mountains, about 40 km away from the Costa Brava. You can do the trail in 3 to 5 days by sleeping in accommodations or in 3 to 7 days with your own tent. Please check the trail map below for better understanding. 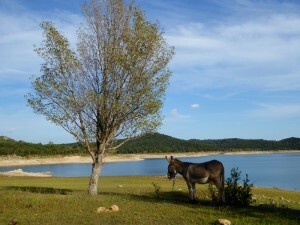 After an introduction in Donkey care, saddling and packing, your Adventure can start! The first part of the trail leads you out of the village through forests and next to meadows. 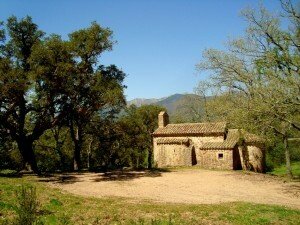 On the way you will pass a little Hermitage Sant Esteve de Llop. Then the trail descends towards the lake getting to one of the rivers that flow into the lake. Now, the trail turns uphill through the forests towards Maçanet, passing el “Moli d’en Robert”, a restaurant next to the river in the middle of the forest. Passing through cork oak forests, you will cross the mountain and walk down the other side to the valley of the Muga river. Here you reach the nice middle-age village St. Lorenz de la Muga. The Muga river brings fresh water from the mountain that lies on the border with France to the Mediterranean. On its way the river flows into the “Pantano de Boadella“, a nice lake. Today you walk around the Lake. You will pass the dam wall of the water reservoir and then arrive at the beach of the lake. In summer time you can walk along the lakeside to Darnius where you can spend the night in “Can Massot“, a Rural Bed and Breakfast (Casa Rural) next to the Village. The hike leads you from La Vajol downhill towards Maçanet de Cabrenys. On the way you will pass an old talc mine. Later, you will find a fountain and also some centuries old trees. You will pass the picturesque village of Maçanet de Cabrenys. On the way to the Camping you will come across some natural swimming pools in the river, a refreshing place to take a break. If you bring a tent and food you also have the option to get to the refugio Santuari de la Mare de Déu de les Salines. From there you reach the top of the mountains and you will have a spectacular view to the Pyrenees and of the French and Spanish coasts. Also, you will see different flora with centuries old beech and chestnut trees. From the Camping Maçanet you take the GR11. This long distance hike brings you to Albanya. You will go through chestnut and oak forests over the mountains of the pre-pyrenees. On the way you will find some abandoned old farm houses and a church which is the home of a bat colony. 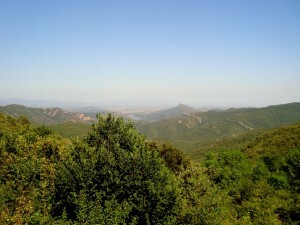 On the way, you will have some nice views over the region of the Alt Empordà and into the Garrotxa. The day ends in the Hípica Tatanca, next to the village of Albanya, where there is a horse barn with accommodation for your donkey as well as accommodation for you. Or, you may go to the Camping Bassegoda Park. If the distance is too long to do in 1 day, you can do it in 2 days by camping somewhere along the way. – Best travel time: Beginning of March to end of June and beginning of September to mid-November. Especially for the hotter time of the year (May/June and September) we recommend this trail because of the swimming possibilities you have on the way. – For dinner you can go to a restaurant. There is always one next to the accommodation or you may prepare your own dinner in some places (Darnius, Maçanet, Albanya). – If you have any questions or you need help for the reservation please don’t hesitate to contact us! From the AP7 in the direction from Barcelona to France take the Figueres exit (N º 3), follow the N-II in direction of France (6 kms), then at km 766 take the road to the left of the N-II in the direction of Darnius/ Maçanet de Cabrenys (Gi-502). From the AP7 direction to Barcelona take the La Jonquera exit (N º 2), then the N-II in the direction of Figueres. Then, at km 767, take the right in the direction of Maçanet de Cabrenys/ Darnius (Gi-502).